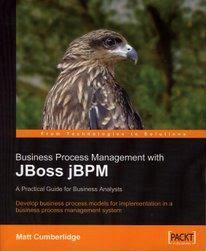 Last weekend I finally came around to reading "Business Process Management with JBoss jBPM". A brandnew book written by Matt Cumberlidge. It fills a gap in the jBPM offerings. Another milestone for the project. The book targets architects, analysts and developers that want to get started with jBPM. Matt succeeded in bringing great value for all three target groups. It starts with a fresh look at the value of BPM and practical guidelines on how to start a BPM project. Installation of every required piece of software is explained in detail. Even less technical people will have no problems to get the software up and running with these very simple step by step instructions. The ordering of chapters captures the full jBPM learning curve. After installation, a prototype business process is build in two iterations. Then, the more technical details are explained to transition from prototype to implementation. And finally a chapter on process improvement explains how the processes can be measured and analysed to find optimizations. jBPM beginners can use this book as an easy to read tutorial to get jumpstarted with jBPM. The available documentation in jBPM itself is sometimes a bit too concise and basics are on the same level as advanced topics. Matt made a good distinction between the basics and advanced topics. The basics are explained in detail and the advanced topics are explained more briefly and referenced. It will lower the treshold for the learning jBPM significantly. Also, I really like the structure of the book. It adds another dimension. Throughout the book, the link is made with the overall software development methodology and how BPM fits into that picture. It shows the value of BPM from the developer's point of view, which is much more interesting then the typical empty BPM promises on a management level. You can get the book at Amazon or directly at Packt publishing. what version of jbpm is used in this book? I like the newest version and like all documentation with jbpm, book may get old quickly. Or is it more concetrated on general design and drawing processes? The book uses 3.2 of jBPM, but as the review says it tackles it from the highest level going down into detail. I can recommend the book as well. Hi.. are there any other books on jBPM? There is some other SOA related book with a couple of chapters on jBPM. Joram, do you remember which book that is ? Can't say it was THAT good. It was just ok imo. Maybe you were referring to this one: Open Source SOA by Jeff Davis (Manning, 2009) ?